Premium Compatible Label Tapes for the Brother P-Touch 1000F printer. Q. I was printing from the machine, the error is displayed and the printing stops. What should I do now? A. You might face this issue when the tape cutter lever is pressed while P-touch is printing. The machine will stop automatically in order to prevent the tape from jamming. Do not touch the cutter lever while P-touch is printing to avoid any further issues. Q. When the label is printed, there is too much margin on both the sides of the text. How can I reduce this? A. You can manage the margin by changing it in the settings. Check the Brother P-Touch 1000F Label Tapes margin from its user guide and select Half or Narrow margin in order to have smaller margins for your label. Q. What does it mean when I got the error message of ‘No Cassette’? A. This error message indicates that you tried to print a label when there is no cassette installed in the machine. Q. Why doesn't my Brother P-Touch 1000F turn on when On/Off key is pressed? A. You need to make sure that the batteries are inserted properly with their positive and negative poles pointing in the correct direction. If the batteries are running low, the power will not turn on. In such case, you need to replace them with the six new (AAA) alkaline batteries. Q. How to prepare the tape cassette for Brother P-Touch 1000F machine? Firstly, open the tape compartment cover by pressing the rough area at the top end side of the machine. If the Brother P-Touch 1000F Label Tape cassette is already installed, remove it from the machine by pulling it straight up. Similarly, if the batteries are already installed, remove them by making sure that the power is turned off in both the cases. Make sure that the end of the tape properly feeds under the tape guides. If the ink ribbon is loose, you can use your fingers to wind the toothed wheel in the direction of the arrow on the cassette. Securely close the back cover, making sure that it snaps into place. After you have installed the Brother P-Touch 1000F Label Tape, feed the tape once and then push in the tape cutter lever to cut the tape. Q. Are these Brother P-Touch 1000F Label Tapes can withstand high temperature? A. These labels are not suitable for the high-temperature range. Q. Why do the labels have a blank horizontal line running through the text of the label? Press the power button to turn off the printer. Disconnect the AC adapter and open the back cover. Remove the Brother P-Touch 1000F Label Tape cassette and remove its batteries. Try cleaning the printhead by using a dry cotton swab to gently wipe up and down along the print head. To avoid any further injuries, make sure to not touch the blade of the cutter unit or any metal parts near the print head. The print head can be cleaned more easily if the optional print head cleaning cassette is used. Q. 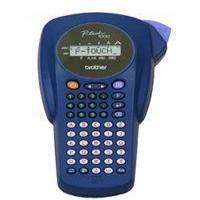 What are the delivery charges if I order compatible Brother P-Touch 1000F Label Tapes from this site? A. Our delivery charge for any order will start from €1.99 inc. VAT. The delivery charges will be higher according to the weight.